Hold’em with Holloway, Vol. 27: Great Laydown or Bad Fold on Poker Night in America? At the end of April, I had the opportunity to play in the Poker Night in America $25/$50 no-limit hold’em cash game at SugarHouse Casino in Philadelphia. 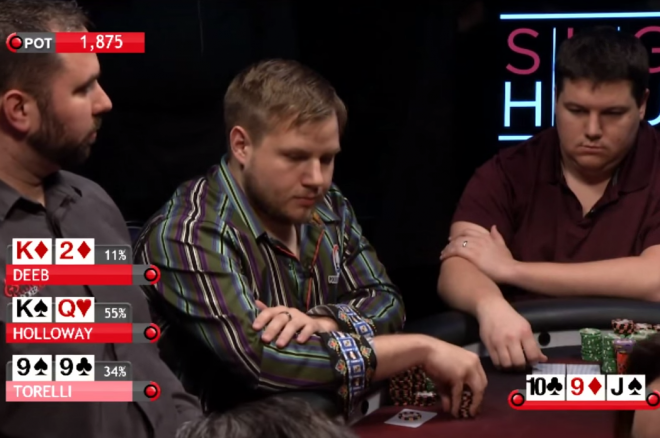 Over the next few weeks, I will be exploring various hands I played in the game, which took place over two days and featured a lineup that included Shaun Deeb, Phil Hellmuth, Darren Elias, Alec Torelli, Dan Shak, Tom Schneider, and Andy Frankenberger, among others. Let me start by admitting this game was way out of my league. It was by far the biggest cash game I’ve ever played, and by no means was I practising sound bankroll management when I agreed to bring two $5,000 minimum buy-ins, one for each day. This was merely an opportunity for me to check something off my bucket list — to play poker on TV against some of the biggest names in the game. Fortunately things went better than I expected. I went on a heater on the first day, which included a double early on. It happened when Frank Olivieri, the owner of Philly’s famed Pat’s Steaks, Dan Shak, and Alec Torelli each put in $100 preflop and I looked down at on the button. I made it $400 to go, Olivieri called with , Shak folded his , and Torelli came along with . The flop gave me top set, and I continued for $700 after it checked to me. Olivieri called with top pair, and Torelli eyed up our shorter stacks before moving all in with bottom set. I snap-called off for $5,550 total and Olivieri got out of the way. “Wow, set over set. What a sick beat,” Hellmuth chimed. He then pointed out Torelli could hit running hearts. Needless to say, my heart skipped a beat when the dealer burned and turned the . “I threw away two hearts by the way,” Hellmuth added. A fourth heart on the river would have been devastating, but fortunately for me the harmless peeled off. Not only did I win the biggest pot of my life, I suddenly had playing chips and some new-found confidence. It showed, too, as I continued to build my stack, which included winning a hand off Hellmuth with jack-deuce (I’ll write about that in a future article). Late in the evening, I happened to be involved in what everyone there agreed was one of the game’s most memorable hands. It began with Torelli raising to $150 holding , I called with , and Deeb three-bet to $600 from the hijack. Action folded back to Torelli, who called, and I decided to call the additional $450. Once again I flopped the nuts when it came down . Torelli paused for a few moments before betting $1,100, and I decided to raise to $3,500. 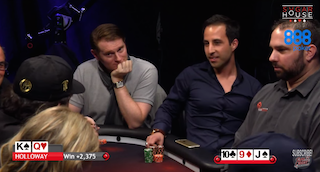 Deeb folded, and much to the surprise of the entire table, Torelli snap-folded his set face up. I actually think Torelli made a good laydown, and I wasn’t surprised to see him make it. I put Torelli on either a set or pair/straight combo, and to me his bet was simply testing the waters. He was fishing for information. In hindsight, I probably should have flatted, but at the time I thought it’d look too suspicious, and truth be told, I was scared of giving them a free card. In reality, by betting I basically turned my cards face up and let both Deeb (who was more than likely going to fold anyway) and Torelli off easy. Things could have played out differently had Torelli opted to gamble, but he knew I had him beat. Granted, maybe he didn’t know I had the nuts, but even if I had pocket tens or jacks he was crushed. I’d been playing fairly tight the entire day and had developed a solid image, so all of those hands were within my wheelhouse. “I think preflop was pretty standard because we were 200-250 big blinds deep. It was a great spot to set mine and I might have the best hand. I just think when you call it changes a lot about the hand. How you were playing — even anyone’s image to call in that spot — the hands that they could have are so narrow. On a board like , I think Shaun is going to check the flop 100% of the time, so I think betting becomes a better strategy with all my hands. Shaun is going to check with aces through queens, but if I bet I can get value from those hands. Giving a free card is such a bad spot because so many cards, like a king, queen, eight or seven, kill my action. So it’s a good spot for me to bet, even if I’m bluffing, because it puts a lot of pressure on one-pair hands. I think when you raise me there, there are so few hands you could be bluffing with. I’m not bluffing that often. The board has smashed everybody and I’m leading into two people. It’s not a spot most people bluff, so for you to raise me there, you can’t really have a bluff. is like the only bluff you have, and I think for you to raise me there with that hand would be a little insane. Torelli, who is a frequent contributor right here at PokerNews Strategy, used sound logic to reach his conclusion, and he made the correct play. Still, I couldn’t help but wonder whether or not he was tempted to put in the additional $2,400 to try and pair the board. “I would call with two jacks because I would think there’s a small chance I’m ahead, and if I’m not then at least if you had and the board pairs I’m in a good spot. Whereas if I have nines, I could be dead to jacks and tens, so the board pairing wouldn’t help me. It was such a bad spot with nines. I’d rather have and then peel. If the board pairs, I can bet. If I have two nines, I bluff the board pairing a lot. If I have , I can hit a king and bust you, or if the board pairs I can bluff it. But I’m not confident enough you have . You could have a set, and then I’m risking that play and betting into the nuts. I’m just not sure you have , ya know? I went on to cash out for $20,775 on the first day (a profit of $15,775), but ended up giving half back on Day 2, which featured a much tougher line-up and me playing off my A-game (more on that in a future article as well). All told I profited $7,850 against some tough competition. Poker Night in America’s Nolan Dalla had some kind words to say about my appearance, and even said I’ll "certainly be invited back." I look forward to that. For those interest in seeing Torelli’s laydown, check out the video below at around the 1:46:00 mark. You can also watch my entire appearance on the archived live stream, and this fall it will air on CBS Sports Network (I don’t know the exact date yet).